The cooking style of the Hakka people, also known as Hakka or Kuhchia cuisine, originated mainly from the provinces of Guangdong, Fujian, Jiangxi, and Guangxi. It is marked by its emphasis on the texture of food rather than the flavour, so they are masters of stewing, braising, and roasting meat. Their skill lies in their ability to cook meat thoroughly without making it tough and to naturally bring out the umami or meaty flavour of their ingredients. The simplicity of their signature dishes is matched only by how delicious they are! The Hakka who settled near the coastal areas of Hong Kong have also developed an almost entirely seafood based cuisine. Instead of using expensive meats, their dishes tend to incorporate an abundance of vegetables with only mild seasoning to preserve the original flavour of the ingredients. Hakka-style restaurants can be found throughout Hong Kong, Indonesia, Malaysia and Singapore so, if you come across one, be sure to give it a try! This signature Hakka dish originally involved baking a chicken over a heap of hot salt, but nowadays most restaurants will simply cook it in brine or cover it with a salty mixture before steaming it or baking it in an oven. 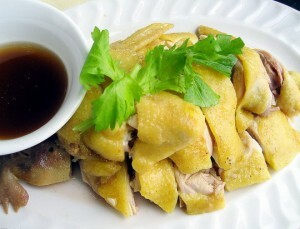 The chicken is served alone without any seasoning but, once you try a slice of its delectably moist meat, you’ll see why! It’s an incredibly simple dish but is irresistibly tender and packed full of natural flavour. 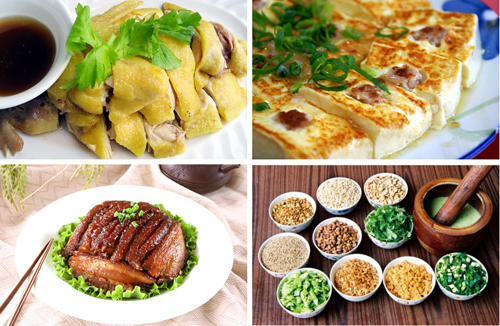 This dish has deep Hakka origins and is one of the most popular in the Hakka community. 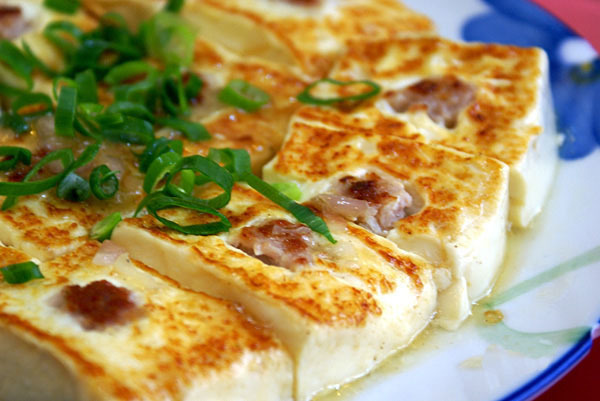 It consists of tofu cubes that have been stuffed with a meaty paste made from minced pork, salted fish and herbs. The tofu is then fried until it turns a rich golden brown, although it can be braised. There are several variations of the dish that include eggplants, mushrooms, and bitter melon in place of the tofu cubes. Traditionally the fried tofu is served in a clear, yellow-bean stew along with bitter melon and mushrooms. Nowadays even more modern variants on the dish have appeared where the tofu is replaced with fried fish or chilli peppers. It’s an unusual dish packed full of multiple flavours that are sure to both perplex and delight your palate. There are two versions of this sumptuous dish; one where preserved mustard greens are used and one where yam is used. The first, which is by far the more popular, is made by taking thick slices of pork belly and layering preserved mustard greens between each slice. The pork is first marinated in soy sauce and sugar while the greens are being boiled. They are then stir-fried together along with the marinade until thoroughly cooked. 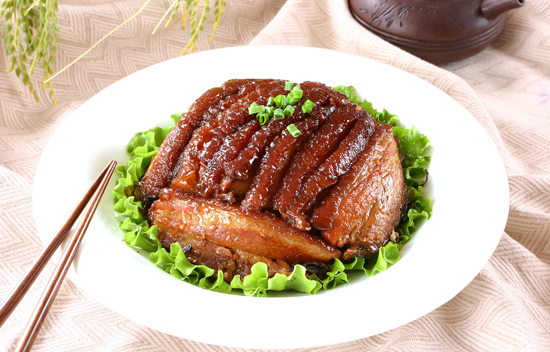 The other, less popular version involves shallow-frying the yam and pork belly together until it is nicely browned and then steaming it with five-spice powder and yellow rice wine. The resulting dish is quite fatty but deliciously indulgent. A mixture of tea leaves (usually green tea), peanuts, mint leaves, sesame seeds, mung beans and other herbs are ground into a fine powder and then added to hot water to form a refreshing tea. 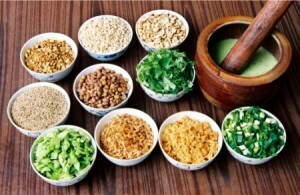 It is thought to have several medicinal properties and is often served with rice, vegetables, tofu, and pickled radish, which can be added to taste. In this way it actually resembles more of a soup than a tea!